I love trying new food from all over the world and getting inspired by the diverse cultures that inhabit London. Not long ago I tried cassava chips and I love them just as much as I love changing things up. They are not necessarily healthier or unhealthier than white potatoes but they are different! They have a sweeter and “drier” character which is perfect for oven roasting. 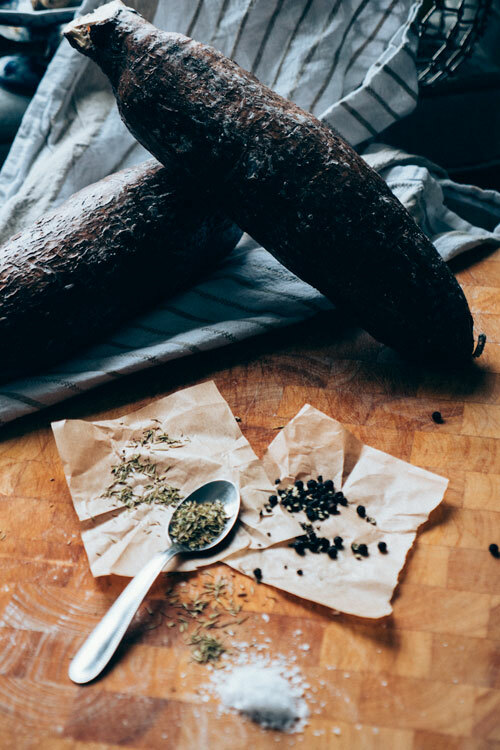 Cassava, or yuca/tapioca/manioc as it’s also called, is a root which is indigenous to South America but also grows in Asia and Africa. It is one of the most common sources of carbohydrates worldwide. I had never heard of it until I visited Arepa and co in Haggerston. It is a venezuelan restaurant serving authentic venezuelan food and they make fantastic cassava chips! Cassava is drought resistant root that grows in tropical or sub-tropical climates. Therefore here in the west we should probably not eat it every week as it must be shipped but one can have a little bit now and again I think. In some parts of Africa this is the staple food and most of the imported roots originate from Nigeria. The roots are a good source of calcium and vitamin C. As a vegetarian/vegan it can sometimes be tricky to find a good source of calcium but here is one. What I am trying to put across that there is nothing extra special about this root in comparison to other staple foods like potato or sweet potato but it is a fun substitute to try and play around with! Remember however that you should never eat cassava uncooked due to its toxic profile in its raw state. But don’t be scared, it’s yummy and completely harmless cooked! Makes enough for 4-5 servings. 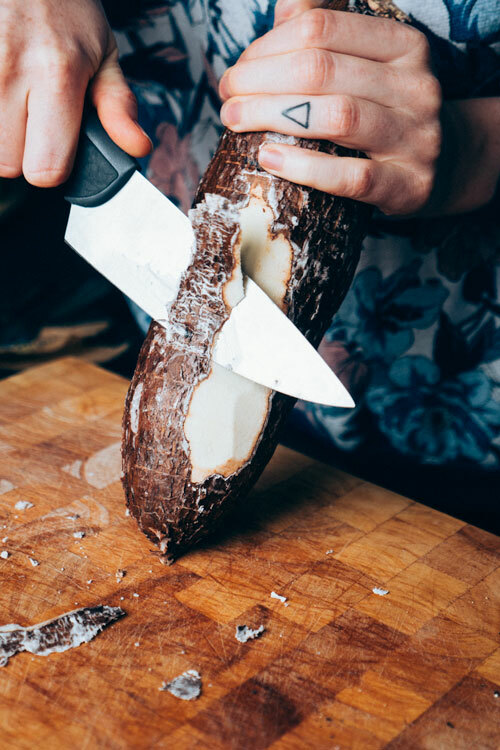 Peel cassava using a knife. Split cassava in half and then each half into quarters. Remove the center of the root by cutting of the inner corner of each quarter. Part quarters into thin wedges. 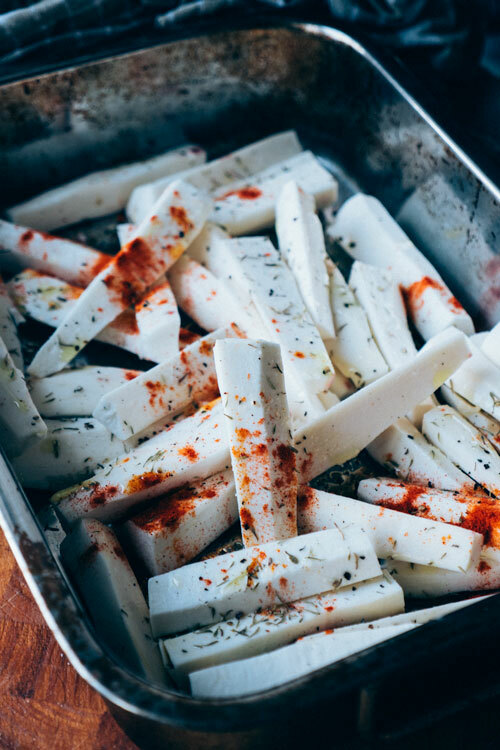 Place wedges in oven tray and drizzle with oil. Sprinkle the wedges with spices. Roast in oven for roughly 45-50 min, turning them mid-way. 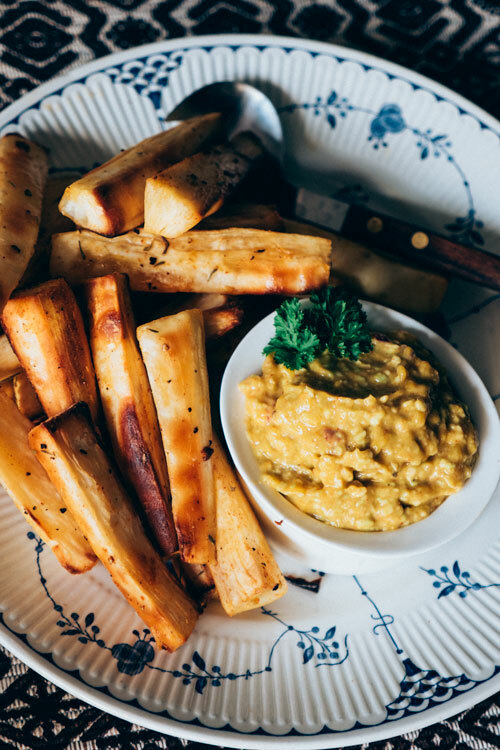 Enjoy as a side to South American or Caribbean inspired dishes or as a substitute to your regular wedges, this dip is a great condiment!